Floof is one of my favorite items we included in this year's holiday gift guide! The kids absolutely love it and I even liked it. Floof has several different kits available like the snowball maker, polar babies, Mr. and Mrs. Snowman, Smoor Party, Sunny Day Clouds and just the regular bucket of Floof. Check out all of Floof's amazing products here! We chose the Mr. and Mrs. Snowman kit. The texture of Floof makes it simple and easy for small fingers to mold. Children can create whatever they like with Floof. I loved the little hat, carrot nose and other pieces that came with our Floof kit. They made our snowman come to life. 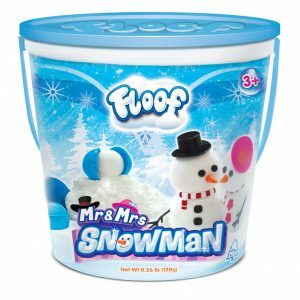 When the kids were done creating we just packed Floof back in its bucket and they can get it back out and create again and again. Floof allows for hours of play fun!